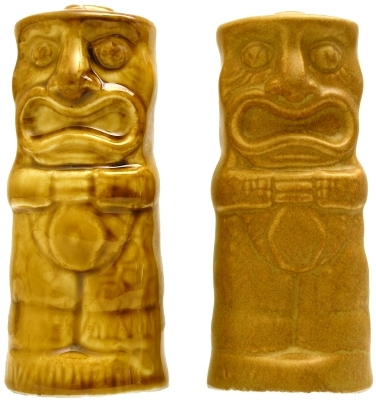 The glossy Tiki is a pepper shaker while the other is the salt shaker. On the bottom of both is printed in ink “Chiki Tiki” and “© agiftcorp”. There were four styles of salt and pepper shakers, this being the “Smile” style with the others being “Drunken”, “Easter Isle”, and “Rasta”. Found in the Chiki Tiki, Polynesian Pop, Salt and Pepper Shakers, and Tiki Collections. 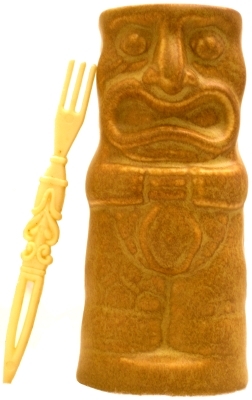 This Chiki Tiki toothpick holder came with plastic condiment forks. On the bottom of both is printed in ink “Chiki Tiki” and “© agiftcorp”. Found in the Chiki Tiki, Polynesian Pop, Tiki, and Toothpick Holders Collections. All Original Content on Scott McGerik's Collections © 2002-2019 by Scott McGerik.